A quick question: how many Foreign Secretaries have there been since the Foreign Office was founded in 1782? Fifty, 100? The answer is 61 - and a portrait of every former foreign secretary hangs on the walls of the Secretary of State’s Private Office; from the first incumbent - Charles James Fox - to David Miliband. There is even a picture of George Nugent-Temple-Grenville who resigned after just three days (19-22 December 1783) following a disagreement with Prime Minister Pitt. This remains the record for the shortest tenure as Foreign Secretary. The Private Office is the room next to the Foreign Secretary’s where private secretaries bring together all of the advice from the FCO ahead of submissions, meetings and phone calls with the Foreign Secretary. Private Office was described by former diplomat Sir Nicholas Henderson (who served as private secretary to five Secretaries of State) as the most exciting room in the whole Foreign Office. It was the place where ‘politics and diplomacy come together, Minister and machine interlock, home and abroad meet; a clearing house for papers, a crossroads, a meeting-point, a bedlam’. 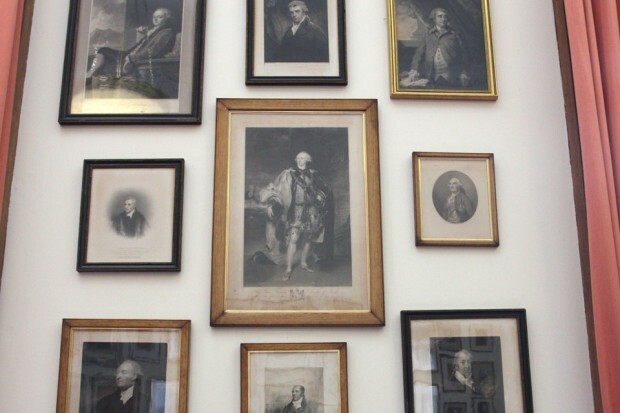 The gallery was first assembled and hung during 1879-80 by Philip Currie, private secretary to the Marquess of Salisbury (April 1878-April 1880, June 1885-Feb 1886, Jan 1887-Aug 1892, June 1895-Nov 1900). Earlier pictures tend to be engravings. Most of the twentieth century incumbents are represented by photographs - such as that of Anthony Eden, looking like a matinee idol. It is an exclusively male club apart from Margaret Beckett (May 2006 - June 2007) the first, and to date the only, woman to hold the post. The portraits cover all four walls. Currently staring across the room at each other are Viscount Castlereagh (Feb 1812-Sep 1822) and George Canning (Mar 1807-Oct 1809, Sep 1822- Apr 1827) both brilliant Foreign Secretaries who once fought a duel on Putney Heath, to settle their policy differences, in which Canning was wounded in the leg. This is thought to be the last time that two members of the Cabinet have literally fought it out. There are also the brothers, Richard and Arthur Wellesley. Richard Wellesley was said to be one of the most languid of British foreign secretaries (Dec 1809-Jan 1812) who rarely corresponded with diplomats, and seldom attended Cabinet meetings or spoke in Parliament. Arthur, better known as the Duke of Wellington, had a short spell at the Foreign Office towards the end of his long career in public life (Nov 1834-Apr 1835). Not all Foreign Secretaries are as memorable as Fox, Castlereagh or Salisbury. Who remembers the tenure of the unlucky Dudley Ryder, Lord Harrowby (May-Dec 1804), who fell down the stairs at the Foreign Office sustaining head injuries that compelled him to resign? However the Private Office gallery ensures that former Foreign Secretaries will not be forgotten. As Henderson noted: ‘However brief his tenure of office or exiguous his place in history books, he will be immortalized here at least’. Keep tabs on the past. Sign up for our email alerts. The Exchequer: a chequered history? This Gallery look fantastic, some of the artwork from back then is magnificent!